What makes the top 5% of sales managers different? Why do their teams constantly outperform average sales teams? Top performing sales managers have a laser like focus. Their team knows where their efforts must go. They know which type of business returns the most profit for the least sales effort. They&apos;re efficient. Top performing teams are motivated, always learning, and constantly focused on goals. Targets are almost always achieved - team targets andindividual targets. Everyone has an eye on goals and puts forth the effort to achieve them. We have been studying top performing sales managers for over 10 years, modelling and documenting why they perform to a higher standard. We&apos;re pleased to share the research results. 10 years of research reveals what the top 5% of sales managers do to succeed. Four simple steps is all that separates best-of-breed organisations from their competitors. We’ve found four things high performing sales managers do differently to average sales managers - illustrated below in the Sales Diamond. 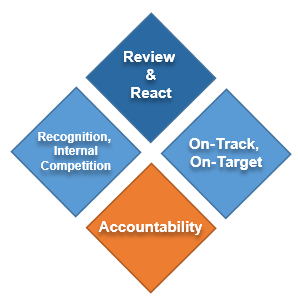 You must be able to review and react to the sales landscape. Understand your marketplace, your customers and their purchase history. Top performing sales managers use business intelligence and data tools to analyse historical sales, and understand profitability to know which type of customers, products or locations drive profits. For example, it&apos;s very easy for sales teams to chase revenue, often resulting in poor profitability. It’s essential to make sure your customer sales information is used for gain. Mine that data and identify which customers are most profitable. Focus your team to get the max return for the time invested in the sales process. You can only do this if you have the right information at your fingertips and review it often. How many sales team meetings have you been in where it&apos;s painfully obvious that one of your sales guys is never going to meet their target later this month? "Why did they not do more sooner in the month? ", "Why did they not put more effort in 2 weeks ago?". This conversation is had up and down the country in sales meetings every month. Top performing teams still miss their targets from time-to-time. It&apos;s rare because they mostly deliver consistent results. In top teams, every member of the team always knows what they&apos;re targets and goals are and what is required to achieve them. At any moment in time, everybody should know where they are and if they are "on-track" and "on-target". Consider a salesperson halfway through the month, but they can only see their final target values. If they are half way through the month, are their current sales total “on-track” to achieving the total target by the end of the month? Make information highly visible if you want motivated salespeople who put in effort early, middle and end of month. I&apos;m sure in a Monday morning sales meeting you have used this phrase at least once, "If you don&apos;t make the calls you won&apos;t get the appointments and you won&apos;t make the sales." It&apos;s amazing how often you need to remind sales guys of this. You need to create a culture of responsibility and accountability where each sales person is responsible for carrying out tasks that lead to successful results. Whatever you identify as the sales process, you must ensure desired tasks get maximum visibility (maybe even set as targets) so they become accountable for their actions, without you having to chase them up every week. Just as with "on-track on-target", the techniques of using automated reports and wall mounted screens are very effective because they deliver amazing results. Nobody wants to be seen, or known, as the under-performing slacker, so everyone puts in more effort. There is a fine line that top performing sales managers tread. To join the elite 5%, you must always ensure your sales team are selling ethically and in the best interests of your customers. However, by injecting a little internal competition into your sales team, you will generate spectacular results! Done correctly, performers in your team get public / peer promotion and recognition whilst the lowest performers feel the gentle pressure of publicly not performing. In my view the best way of achieving this is with a live TV leaderboard that shows sales per salesperson and their target. Ideally, this leaderboard should be as real-time as possible so each salesperson gets to enjoy their public success as close as possible to the win. Salespeople who do the best get plenty of visibility and the guys not doing well enough feel the need to work harder to get &apos;back on par&apos;. The top 5% of (high-performing) sales managers only do a few things differently, but these make a huge difference to company profitability.